This mat is our #1 seller! Uniquely constructed with durability and flexibility in mind, the Light Duty Ring Mat is ideal for workstations, laboratories, kitchens, and bars. 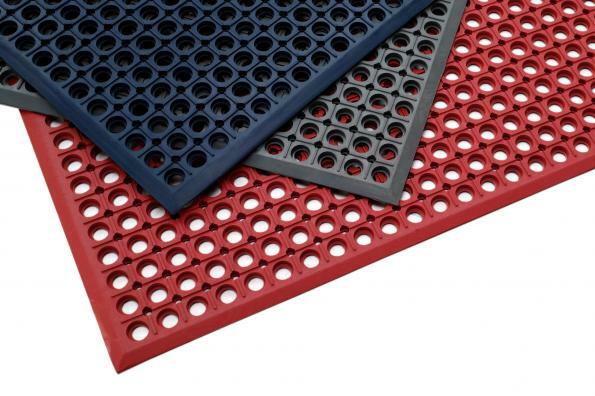 This mat has been eengineered for excellent comfort, safety and drainage. It is compounded to allow for maximum anti-fatigue features, providing a safe and comfortable standing/walking area, while reducing noise levels. Molded, beveled edges on all four sides allow for easy cart access and added safety precautions. Drainage holes allow for fluids and debris to filter through easily, creating a dry and comfortable workspace. In an effort to provide you with an even more cost-effective solution, we have developed a mat to suit the constraints of any budget. Our Light Duty Ring Mat is now available in a 20-pound version!